Adding to Cunningham Road’s culinary skyline, Feast India Company bring back food and charm from the days of yore, in fine dine setting. Even the bungalow it’s set in, in almost 100 years old! We went trudging off to get ourselves a massage at SPA.ce on Cunningham Road, but lo and behold, it’s shut down. But in its place, we discovered a wonderful new fine dining restaurant, Feast India Company. And in a colonial setting, a bungalow that’s been around nearly 92 years, we were impressed by the play on the name, and well as the lovely ambience. Opposite Fat Buddha, this Indian restaurant focuses on traditional Awadhi cuisine. A haveli-style home is the setting, and you can make out that it has not been done to just look regal and from a glorious bygone era; it very obviously is from that age! Each room of the restaurant has decoration that is timeless — think almirahs, clocks, ceiling fans and charming switch boards reminiscent of grandad’s home. We love that Feast India Company has retained the central courtyard, but has covered up it up so you have the illusion of dining under the stars or rain, but are safe from the elements! We kicked things off with Chicken Gulfam — chicken marinated in mint, yoghurt, spices and then cooked in a clad oven. Slightly bland, but when we tasted the Gulnar fish (with sole fish), that was coated in poppy seeds and pan fried, we forgot the poor old chicken! Vegetarians, the paneer options here are plenty, and we rather liked that the paneer was soft and fluffy — not the usual supermarket sort. The Ajwaini was our favourite, with the puffed lotus seeds and lotus stem a close contender thanks to the different flavours of mace and cardamom. The shorbas are touted to be good as well, if you want to ease up on the solid appetisers and pick those instead. For mains, we pick the not-at-all Awadhi option of Laas Maas (because one must never say no to it), Dal Makhani and Paneer Awadhi Korma. Creamy and rich, the dal went well with butter naans and kulchas. 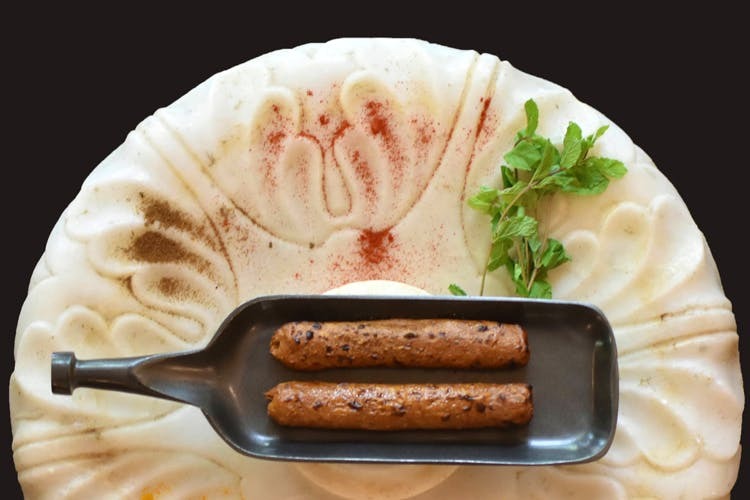 Do try the Sheermal, a saffron flavoured roti, with origins in Iran. It’s a tad sweet, but this flatbread can easily be eaten just by itself. But when there’s a korma, laden with spices and paneer, have them together. The Laal Maas was a bit of a disappointment as it lacked flavour. And unfortunately (or fortunately), since this recipe is part of my heritage, I’m a bit of a stickler. Maybe I’ll give it another shot next time, since the rest of the food was wonderful. The not-too-sweet and quite flawless Phirni helped to end things on a sweet note. We (over)heard good things about the biryanis — be it Sultani Khushka or traditional Dum Gosht, and plan to head back for that. And the ambience, of course.